Think about the last time a parent or a respected superior really laid into you for screwing something up—maybe they had a point, maybe not, but did you immediately move on with your day, or did the reprimand roil inside of you for a while, with a litany of what-ifs running through your mind, ways you could have better defended yourself, or even prevented the scolding entirely? This is the mentality Poe is living in when he first lays eyes on Amilyn Holdo, a character built from the ground up specifically to threaten him. In terms of the in-universe “reality” of Poe’s character I don’t think it’s a gendered thing—an elegantly dressed and fancifully coiffed male Vice Admiral would have been an equally jarring contrast with the General Organa he was used to—but I do think that here on Earth, Holdo’s appearance and Poe’s reaction to it are meant to raise some very gendered questions, and the arc’s denouement presents a very pointed answer: yes, you can look like that and still be trustworthy, still know what the hell you’re doing. But that doesn’t mean Poe is the bad guy—it doesn’t even necessarily mean he’s wrong. Fresh off a dressing-down and demotion from Leia, a surrogate mother figure who now hovers on the brink of death, Poe is in the worst possible headspace to accept the weird new plan of a weird new commander. Whatever feelings Holdo’s fashion sense is designed to provoke in audiences, the truth is he was primed to reject pretty much anyone who wasn’t Leia and wasn’t him—sometimes new people just rub you the wrong way, and sometimes (often) that has less to do with them than with the circumstances in which you meet them. Poe is feeling chastened and hurt and worried sick all at once; even if he literally spoke the words “I don’t trust Holdo because of how she looks”, who’s to say he wouldn’t just be seizing on that as a justification for acting out? And would that really be so hard to understand? General Organa herself—via Poe and Holdo’s disparate understanding of “what she would want”—is the bedrock of this storyline, and while she’s definitely one of the more consistent major characters in the Star Wars saga, she’s made her own share of questionable choices. The earliest version of this piece began life more than eighteen months ago, in response the the Star Wars Rebels episode “A Princess on Lothal”—not because she makes some big mistake there, but because it planted the seed in my head that I’d enjoy seeing a fifteen-year-old Leia have a brief romantic relationship with Ezra Bridger. Not because they were a good pairing, but for exactly the opposite reason: I wanted to see a younger, less mature Leia finally do something stupid, so that she might learn from it. That piece never came to be, but as it happened I got a similar storyline last year in Leia: Princess of Alderaan, thus sparing the world another of my Ezra hot takes. It’s easy to make the case that Kier would have been “better” for Leia than Han was; certainly their life together would have been safer. Leia chose the Rebellion over Alderaan because her sense of duty was greater than any one planet, but she chose Han because, well…why the hell did she choose Han? Ever since The Force Awakens, the conversation around Han (and expectations of Solo) has emphasized his loutish, haphazard manner over his reputed skills as a pilot and a leader, even as Leia has come to be more revered than ever. 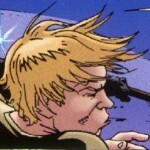 So what does it say about Leia that she fell in love with such a man, arguably at the price of their child’s stability? It says that she’s only human, and the heart wants what the heart wants—and to hell with anybody who doesn’t get it. Some people rub you the wrong way for no logical reason, but others just feel right, on a chemical level, even if you have no idea why. Han and Leia are wrong for each other and made for each other in equal measure, and that tension is what makes them such great characters. Star Wars has good guys and bad guys, but that’s not what it’s about; it’s about how people become one or the other. Only in rare cases—really only Palpatine, and debatably Snoke—is someone’s place on the moral spectrum totally definitive; most of the other “evil” characters have shades of compromise or conditioning or cluelessness that color their actions, and it’s possible that we could jump in at another point in their lives (Boba Fett as a young orphan, say) and find them totally understandable. Perhaps that’s why I’m able to find some empathy for fans enticed by the Empire or the First Order while still comprehending their evil—there but for the Force go we. Poe reacts unreasonably to Amilyn Holdo, but that can be true at the same time that Holdo is unreasonable in withholding her escape plan—and it certainly doesn’t mean either of them were poorly-written. 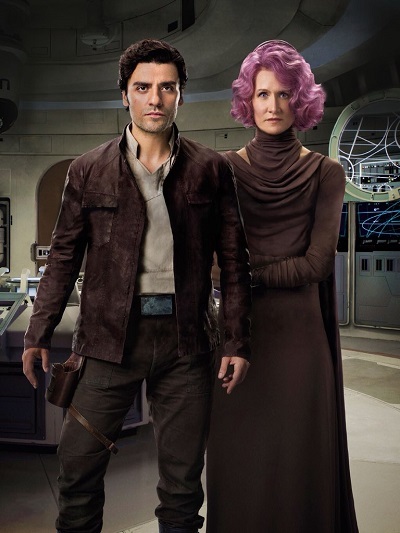 Holdo may be in the right from a chain-of-command perspective, but the reality is she’s being deliberately opaque as a means of testing how Poe responds, and later she even confesses that she likes him, “troublemaker” though he is. Is the flight from D’Qar the ideal time for such a test? Maybe not, but when is anything in the Resistance ideal? If you think Holdo’s decision-making is questionable on the Raddus, you should have seen her at fifteen. Both Poe and Holdo make unreasonable decisions in The Last Jedi, but Poe is the one that learns from it because he’s the one in a position to need the lesson; if he didn’t learn he’d be a lesser character, and if their conflict had never happened the story wouldn’t be as interesting. The movie is all about what we expect from our heroes, and what happens when their humanity gets in the way. When our need to see them as “good guys” obscures the full superposition of their humanity we close ourselves off to further growth, and exploration of what makes them tick—because “the Luke Skywalker I grew up with would never do such-and-such”. Maybe not, but that Luke Skywalker was boring; a finished sculpture with no more marble to chip away, no more contours to reveal. A great soul with nothing to do. Perfectly put – thank you! This was excellent, all around. I feel I couldn’t express well how I feel with Poe and Holdo with the right words. I like both, they’re my favorites in TLJ, but I was also very irked with both of them for their decisions. The way you wrote your insight helped me with that, and I still like both, dumb decisions and all. He’s definitely the bad guy. That stunt with the Dreadnought? Dreadful. Nepotism is probably the only reason why he’s not in the brig. And I would disagree that Holdo wasn’t poorly written. The fact that the writers did everything they could to make her look bad, incompetent and foolish before sweeping the rug from under us is one of the things that I absolutely despised about that movie. I wanted it to happen, expected it to happen, but they just waited way too long before actually doing it.